TODAY marks 200 days to go in the countdown towards the kick off of the FIFA U-20 Women’s World Cup in November. Local Organising Committee Chief Executive Officer Seamus Marten said a lot has been happening behind the scenes to ensure that Papua New Guinea successfully hosts the FIFA U-20 Women’s World Cup come November. “The coming months will be exciting because we will be launching the mascot, the trophy and the balls that will used during the tournament. We also have the tri nation’s series between the PNG Women’s U-20 and USA and Japan, so it is quite an exciting build up for us. “Right now, we have a team of host broadcasters including FIFA TV who are in the country to map out the best possible camera positions for the telecast of the tournament. It’s very important for them because they will be running the broadcast coverage of the matches to 100 countries around the world. It will be an opportunity for Papua New Guinea to show the world that we can,” Marten said. The team comprises representatives from Host Broadcast Services (HBS), Mediapro and Transvision who are the transmission service providers to the host broadcasters and FIFA TV. 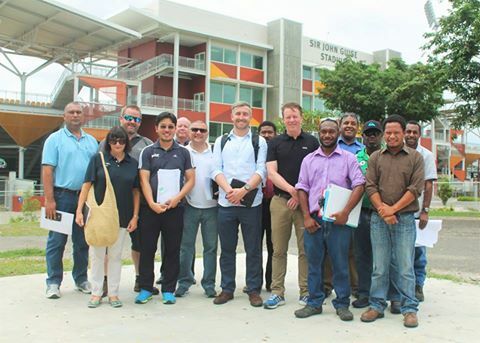 They will visit Sir John Guise and the National Football stadium and will inspect potential International Broadcast Coordination Centre (IBCC) sites. The team will also be meeting with EMTV who have the broadcast rights to telecast the tournament within PNG and will also be meeting with Telikom and NICTA officials. An estimated 200 million viewers will be watching the FIFA U-20 Women’s World Cup from 100 countries worldwide. The FIFA U-20 Women’s World Cup will be held from 13 November to 3 December.